I love late-season skiing under the strong spring sun. 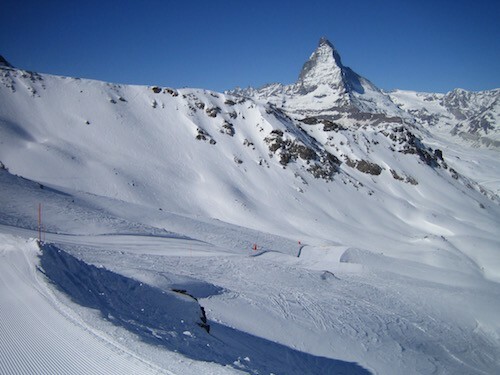 Last week, I spent a few days in my favourite European resort – Zermatt in Switzerland. 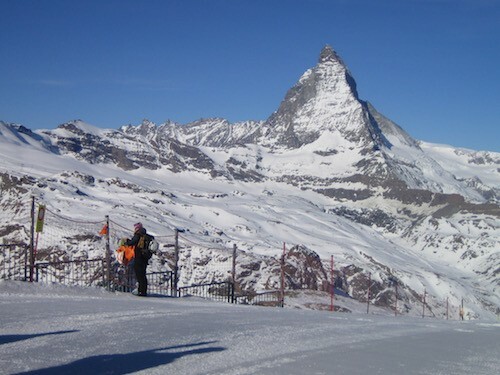 Zermatt has wonderful high skiing (loads of skiing above 2500m and a high point of 3820m leading to the highest piste in Europe). 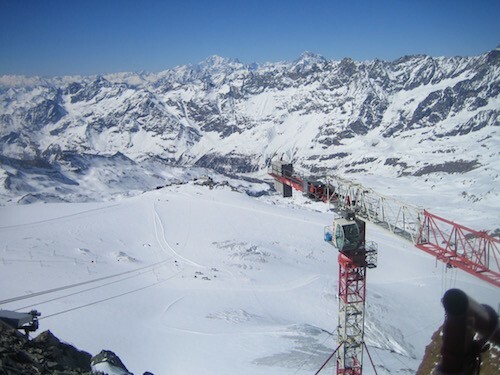 It is also linked to the skiing of Cervinia in Italy, giving a total of 360km of pistes. 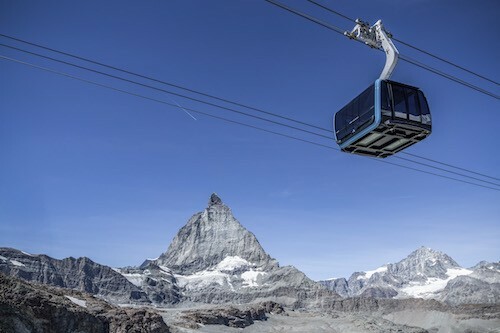 Access to the high point on the Klein Matterhorn mountain has been massively improved this season by the opening of the new 28-seater Matterhorn Glacier Ride gondola which whisks you up almost 900m vertical in just nine minutes. It replaces the old cable car (which remains in place for emergency use), for which long queues were notorious. I took the new gondola twice during my visit and was very impressed – really comfortable, no queues, fabulous views on the way up and from the top. Back to the skiing. Devotees of WTSS will know that I love early starts in Zermatt. So for two out of four days, I took the first (8am) train up to Gornergrat (3090m). It arrives shortly after 8.30am and a pisteur who travelled on the train with you opens the skiing by removing the rope closing the pistes. 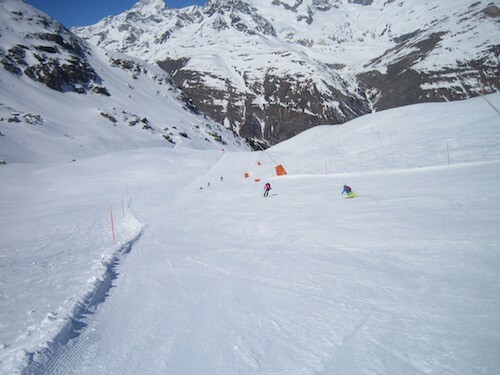 There are very few fellow skiers on the train and they soon disappear, leaving deserted, well groomed pistes to enjoy. On my last day I enjoyed two deserted runs down to the chairlift at Riffelberg, followed by a lovely deserted run down to Gant and three runs of over 1060m vertical each down White Hare (my favourite run in Zermatt) from Hohtälli down to Gant before many other people started arriving at around 10.30am. What a start to the day – no more than two other skiers in sight until 10.30am! With wall-to-wall sunshine and excellent snow. The quietness of the pistes made a delightful change from the hordes of people I’d encountered on the pistes in most of the Italian and French resorts I’d visited this season. By 11.15am it was time for a coffee (well, OK, a beer, I admit) break in the isolated Fluhalp restaurant with fabulous views between Rothorn and Gant. The excellent mountain restaurants are a real highlight of Zermatt – so long as you don’t translate the CHF prices back into pounds. There are lots serving excellent food, some featured in the Michelin guide and all with phenomenal views. Even with a self-indulgent two-hour lunch break, I still clocked up my record amount of skiing for a single day in the season – over 65km and nearly 10,000m vertical according to my Ski Tracks app. The runs down to resort level were slushy in the afternoons but the higher runs were still in great wintery condition. Things are looking good for skiing during April, including Easter and during the Zermatt Unplugged music festival (9 to 13 April). The festival features a wide variety of live music (more than 20 bands some days) in the village and in mountain restaurants, including Ronnie Scott’s All Stars jazz band, Boy George and Culture Club and many others.